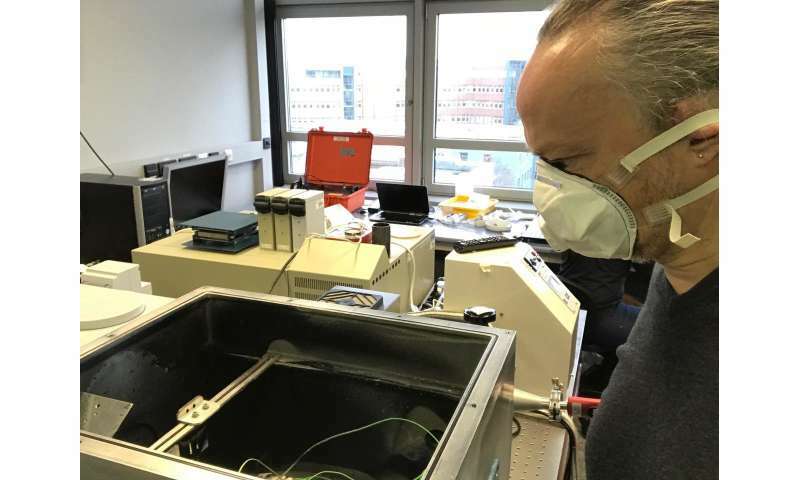 The German Space Agency (DLR) has opened a new simulation facility at its Planetary Spectroscopy Laboratory (PSL) in Berlin. The facility could help researchers better understand the surface of Venus hidden behind the planet's dense atmosphere. As part of the PSL, the newly opened facility is located in a temperature-controlled room in the Institute for Planetary Research in Berlin. It enables planetary researchers to analyze rock samples similar to those on the hot surface of Venus at temperatures up to 1,830 degrees Fahrenheit (1,000 degrees Celsius). Studying the surface of Venus is a challenge for space and ground-based observatories due to a thick atmosphere of mainly carbon dioxide and clouds of sulphuric acid surrounding the planet. To avoid this obstacle, scientists are making use of the so-called "spectral windows" in the atmosphere that are transparent to certain wavelengths of infrared light to gather data on the surface remotely. PSL's facility could be helpful in such studies as it gives the possibility to analyze spectroscopic emissions by analogue rocks across the range of temperatures found on Venus and at all known atmospheric windows of the planet. "For Venus, it was commonly accepted that compositional data could only be obtained by landed missions because Venus' permanent cloud cover prohibits observation of the surface with traditional imaging techniques over most of the visible spectral range. Fortuitously, Venus' carbon dioxide atmosphere is actually partly transparent in small spectral windows near one millimeter. These windows have been used to obtain limited spectra of Venus' surface by ground observers, during a flyby of the Galileo mission at Jupiter, and from the VMC and VIRTIS instruments on the ESA Venus Express spacecraft," Jörn Helbert of PSL who led the development of the new facility, told Astrowatch.net. The newly built chamber could be essential for interpreting the data collected by telescopes on the ground and in space, as it provides lab-based measurements necessary to validate the results. Helbert noted that any interpretation in terms of mineralogy of visible and near-infrared spectroscopy data from orbiters requires spectral libraries acquired under conditions matching those on the surfaces being studied. 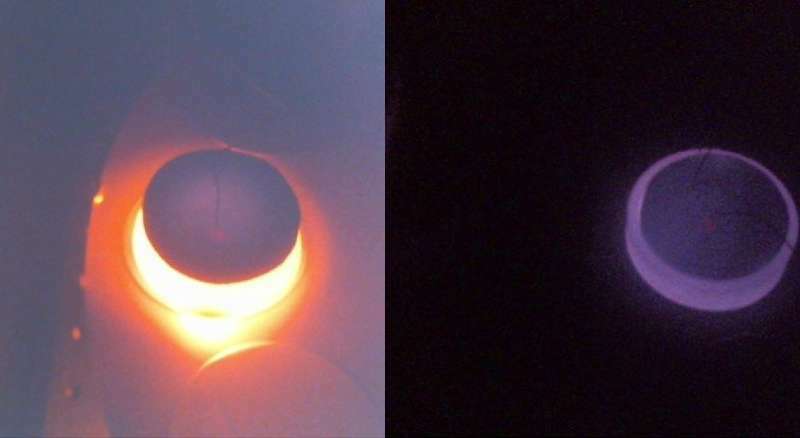 "Many efforts have been made since the landing of Venera 9 and 10 in 1975 to obtain optical spectra of Venus analog materials at relevant temperatures. PSL took up this challenge, building on nearly a decade of experience in high-temperature emission spectroscopy in the mid-infrared. After several years of development and extensive testing, PSL is now in routine operation for Venus-analog emissivity measurements from 0.7 to 1.5 micrometers over the whole Venus surface temperature range," Helbert said. The relatively transparent near-infrared windows in Venus' dense carbon dioxide-rich atmosphere (approximately 0.86, 0.91, 1.02, 1.11, and 1.18 micrometers) allow nighttime orbital imaging of light emitted by the surface. Those six bands may permit mineral identification in a manner similar to the Compact Reconnaissance Imaging Spectrometers for Mars (CRISM) instrument onboard NASA's Mars Reconnaissance Orbiter (11 channels). "We can demonstrate that with an orbital instrument basalt spectra can be easily discriminated from basaltic andesites, andesites, and rhyolite or granite. So we can address the question whether the oldest landforms on Venus called tesserae are indeed comparable to Earth's continents," Helbert noted. He added that at the same time, surface weathering by oxidation can be detected from several band ratios. For instance, hematite is easily distinguished from magnetite and pyrite from 0.99 to 1.02 micrometers. "This gives as an insight in the interaction between the surface and the atmosphere and especially its variation with altitude," Helbert said.